Search engine optimisation is an essential for promoting your bookkeeping business online. It is crucial to have knowledge of search engine optimisation if you wish to expand your bookkeeping business. Your potential clients have quite a few options. It is always easier for prospects to find your site if it ranks on top of the search results. You don’t need a large budget for search engine optimisation. You will start seeing instant business results after you achieve SEO rankings for your business. SEO is a way to get organic traffic and leads to your site. It rewards those who make more effort, rather than those who pay more. So, if you have a small bookkeeping business, you can easily compete with some of the bigger players with search engine optimisation. Running a successful SEO campaign does involve time and effort and you can choose to outsource it to a professional service provider. However, you do need to invest time and effort if you’re going to run a successful SEO campaign. You’ll need to make a commitment to produce content regularly, and analyse the results. And you’ll have to wait patiently for improvements. You need to have a long-term strategy for your search engine optimisation goals as you may not see results in a few months’ time. The primary goal of search engine optimisation is to get your site to be shown on top of the search results, for the relevant search queries. It will enable you to get more visitors to your site. Search engines have an automated system of tracking content from different websites available on the internet. They do this with the help of search engine spiders. They try to find the most relevant answers for search queries and put them on the search results page. The search engine provides its users with information that’s freely available. They want searchers to find the best possible information and answers whenever they type in a query. You need to understand this objective so that you can strategize your SEO efforts accordingly. If you can provide the right answers to searcher queries and educate them better than your competitors, then your chances of ranking higher on search engines will be relatively higher as well. The more you impress online searchers, the easier it will be for you to catch the attention of the search engine spiders. 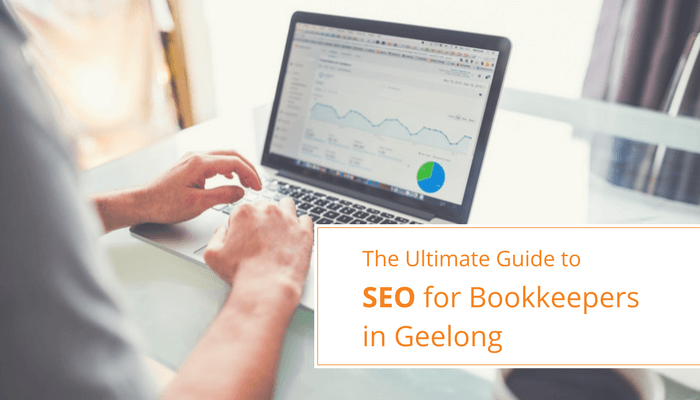 If you rank on a keyword like ‘restaurants in Geelong’, then it will be of no use. Your site should reflect that you provide bookkeeping services. If it does not, then search engines won’t categorise it accordingly and it won’t rank for the relevant search queries. Naturally, the intent behind the above two keywords is different. As a bookkeeping service provider for small business, you need to target the first keyword for your website rather than the second one. Now create a list of keywords that you wish to target and optimise your content for these keywords. You must optimise the headlines on each of the pages of your website. Try and use your targeted keywords in each of the headings of your pages. Headings must be denoted by H1, H2, H3, etc. tags in the coding. The most important heading on a page must be H1 while the next important one should be H2 and so on. You need to optimise the meta tags of website pages by adding a suitable title and description to your pages. The title and description of a page are that content which is visible to searchers in the search results. You must ensure that the meta title and description are attractive and showcase the benefits of your services. Try and include your targeted keywords in the content, but don’t stuff too many keywords. Describing the function of images of your site, helps Google to know what your image is all about. If the searchers are looking for an image on Google, the search engine gives them the appropriate results based on the Alt text of the image. You must ensure that all of the images have an Alt tag on them along with an Alt text that’s optimised for the relevant keywords. A domain name is how your site gets identified on the web. Some businesses use business vertical or keyword specific domain names. But, it is recommended that you use your brand name as your domain name. If you have a new business, then you can create a keyword specific brand and get SEO benefit from it. Your business website should be easy to navigate, and the most important pages should come first. You must also ensure that the URLs of your website pages do not have any special characters like %& etc. Optimising your URLs with the relevant keywords will improve their chances of ranking up high on search engines. What is Authority and How can You Improve It? Authority measures your expertise in a particular subject. Those sites which can build their authority rank higher on the search results. The information and content you provide on your site must showcase you as an expert in Bookkeeping and Accounting. One of the best ways to improve the authority of your site is to publish expert content on a regular basis. You should add blog posts, ebooks, whitepapers, infographics and videos to your website, on a periodic basis. The content should not just showcase your expertise, but it should be helpful to your target audience. You must do guest stories on high authority blogs and earn quality backlinks for your website. The more quality backlinks you generate for your website, the higher will be its Domain Authority. One of the most critical ranking factors for any site is its overall user experience. When a user comes on to your site, they should be able to find information easily and efficiently. They should get an accurate answer to their search query and should be able to navigate through your site easily. If the visitors do not stay on your site for long, then it won’t get a ranking on the search engine pages. If your site works for the users, it will work for the search engines and ultimately work for you as well. Updating the content of your site and its blog will keep it fresh and up-to-date. Search engines love fresh content, and therefore, you must keep updating your content to improve your chances of ranking higher up on the search engines. You need to, maintain therefore an optimum frequency of publishing content on your site. The content you publish must be original and should be engaging for your site visitor. If a site links back to your site by sharing your content and link in their content, it creates an inbound link for you. If another site in your domain is recommending your content, then it is giving positive signals to Google about the quality of content on your site. Inbound links add to the confidence that search engines have in your business. If you get an inbound link from a high authority site then the results are even better. The better your content, the higher will its chances of getting shared by authority sites and this will ultimately get you better search engine rankings. Imagine, visiting a website that takes 5 seconds to load. That’s too slow by all standards, isn’t it? If you have a bookkeeping website that takes ages to load, your visitors would certainly be driven away. Most of us as customers are very impatient and have a very short attention span. If we go online, looking for a service, we type in a search query and we want instant answers. We will visit 3-4 websites and finally contact the one we find the most appealing. Website speed forms a crucial part of search engine optimisation. You must take your site developer’s help and ensure that your site is loading in less than 2 seconds. Imagine a prospect coming on to your site finding that they have landed on the wrong page. Now that can be quite embarrassing for your business. You must ensure that all of the pages of your site are up and running. For the old and outdated pages on your site, you must use a 301 redirect to redirect these pages to the most relevant and active pages on your site.Take the help of your site developer to track these issues and get them resolved. The account helps you get verified on Google. The search engines use this information to categorise your business in a particular location and show you up for local queries. You can also request your loyal customers to add a positive review on your Google My Business Listing. It will help you to improve the credibility as well as rankings of your site. Listing your business on some of the high authority local business directories is an essential for SEO. You need to simply create a profile on popular local directories, with your name, address, contact details and business detail. Some of the popular local directories are Yelp, True Local, Bing Places and Yahoo! Local. Take a look at the directory listings of some of the high ranking bookkeeping businesses in Geelong. Social media activity is an SEO ranking factor that you can’t choose to ignore. You must create your business pages on channels like Facebook, Twitter, LinkedIn, and Google+. Optimise these pages by adding a brief description of your business, an appropriate profile picture, and a cover image. You must post regularly on these channels and expose your content on these channels. Your social media activity is a crucial ranking signal for the search engine spiders. You must audit your website on a monthly basis to check for SEO related errors. Make use of tools like SEMrush, Moz, Ahrefs and Screaming Frog. These tools with give you a list of technical errors that you need to resolve on your website, to make it search engine friendly. Pingdom and Google PageSpeed Insights are useful tools to help you analyse and resolve the load speed related issues on your site. You can use free tools to like Responsinator and Responsive Design Checker to check the mobile responsiveness of your website. Optimising your bookkeeping business site for search engines is an ongoing process. You must hire a professional agency to upgrade your website and optimise it for higher search rankings. Hope you found this information useful. Do share your comments in the section below.